Germans eat pretty weird stuff. If you are adventurous and you would like to try something bizzare, by the end of this blog post, you will have the list of 12 specialities that you should try on your trip to Germany. I’m going to start this list with a very popular drink which is called Apfelschorle. Apfelschorle is actually an apple juice mixed with sparkling mineral water. None of the Germans could understand why I start this video with this drink, but actually, why would you have diluted apple juice when you can drink it pure? I do understand that in summer this is a very refreshing thing to drink, but it’s still very weird for people from other countries. Apfelschorle is a very popular drink so you can find it in any restaurant and any supermarket in Germany. Talking about drinks, I’ve got another weirdo for you. This is Spezi. Spezi is a mixture, a very weird one. It’s coke mixed with orange soft drink. Yes, you’ve heard that right, orange soft drink. I think this doesn’t need any comment. As well as Apfelschorle, you can get it in every German restaurant and supermarket. Actually, this one doesn’t taste as bad as you might think. The number three on my list is Sülze. 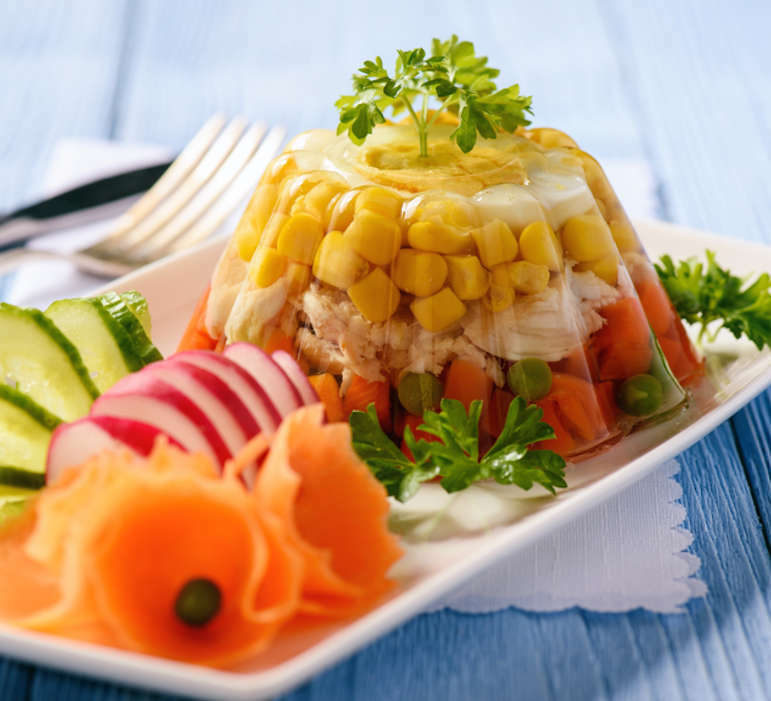 Sülze is a pork, chicken, or vegetable aspic, or meat jello, that is usually served as a snack or a side dish. Meat aspic can actually contain veal feet or pork heads which is pretty weird stuff to eat. Now it’s going to get even weirder, my family eats it with white vinegar on the top. If you want to try Sülze in Germany, you can get it in any supermarket from the jar, or you can go to the butcher shop. Let me know in the comments down below if you would like to try veal feet. I’ve heard that they’re very, very good for the brain so why not? The next thing on my list is Hacke Peter. Hacke Peter is well spiced pork minced meat that is usually served on the bread. As you can see in the pictures it can have different shapes and now you can see also my creation. I hope you do like it. You can find Hacke Peter in any butcher shop in Germany. I wouldn’t buy it anywhere else. It’s still a raw meat that you’re dealing with. Another weird speciality to try in Germany is for sure blood sausage. Blutwurst so-called blood sausage, it’s made out of pork and obviously the blood of the pork. Sometimes, blutwurst is spiced with barley. Although the sausage inside is cooked, it is usually served warm here in Germany. 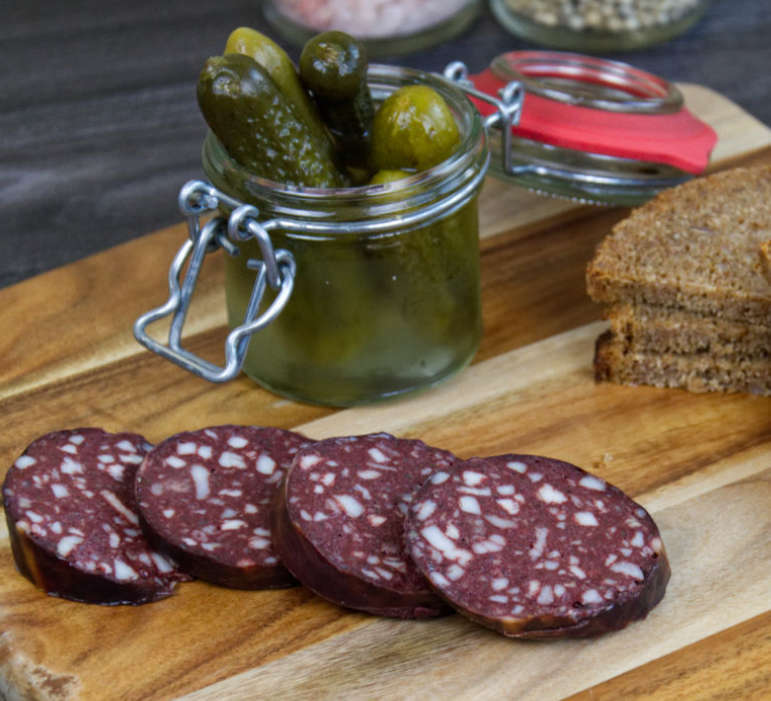 You can get blutwurst in any butcher shop in Germany, but in particular regions, it is served different way. If you are in Berlin, you can get it with liver and potatoes. If you are in Cologne, you can get it with potatoes, onions, and applesauce. Personally, I like this one a lot. The next dish on my list is Fliederbeersuppe, and it’s a fruit soup. You probably think when I say, “a fruit soup,” that’s going to be a soup that’s going to be chilled and served in the summer. You are completely wrong. This soup is served hot and it’s served in the wintertime, in modern Germany. 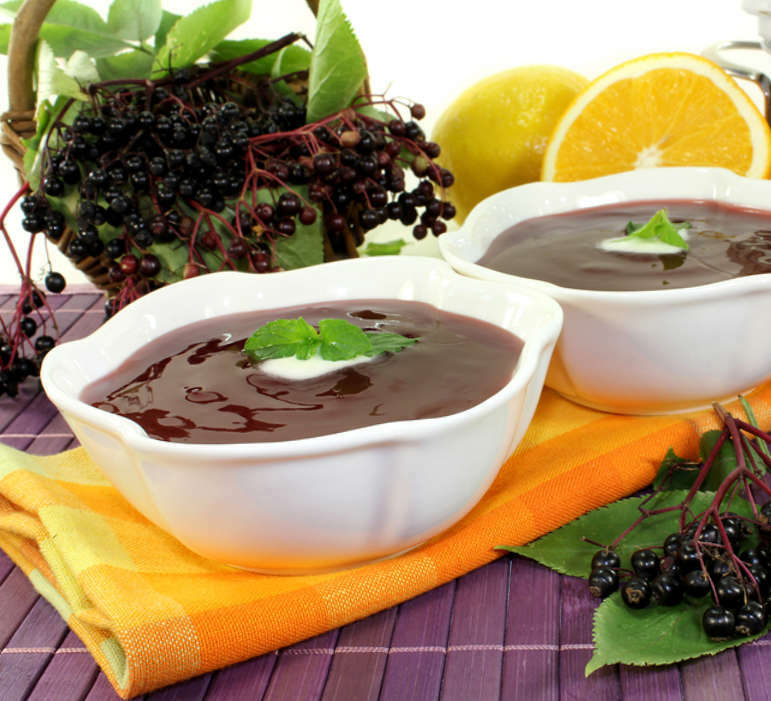 The soup is made out of elderberries, some apples and pears, and it’s served with soup dumplings. It is also spiced with some cloves and cinnamon. Apart from Northern Germany, you can also have it in Saxony, Denmark, and Austria. Labskaus is another specialty I would like to tell you about. Labskaus is a very popular dish in Hamburg, Lubeck, and Bremen. Labskaus are actually potatoes mixed with corned beef or salted meat, and onions. In Hamburg, I’m pretty sure that they are served also with beet juice, herring, and pickled gherkin. It seems like Northern Germany wins when it’s about weird dishes. Matjes mit Speckstippe is a Northern Germany surf and turf. And I know what you’re thinking. You imagine now steak with some prawns, beautiful girls … no, no, no, my dear. 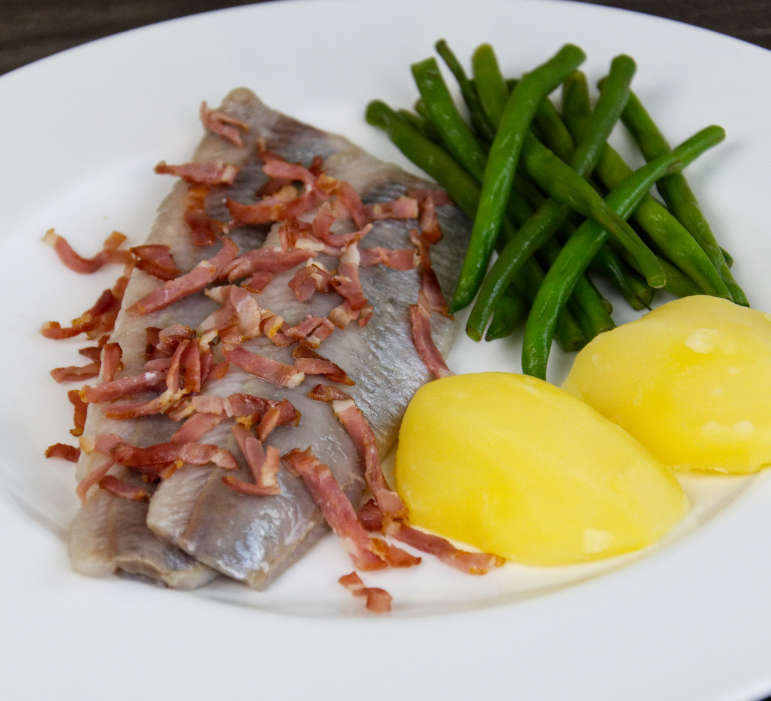 This is herring served with bacon. 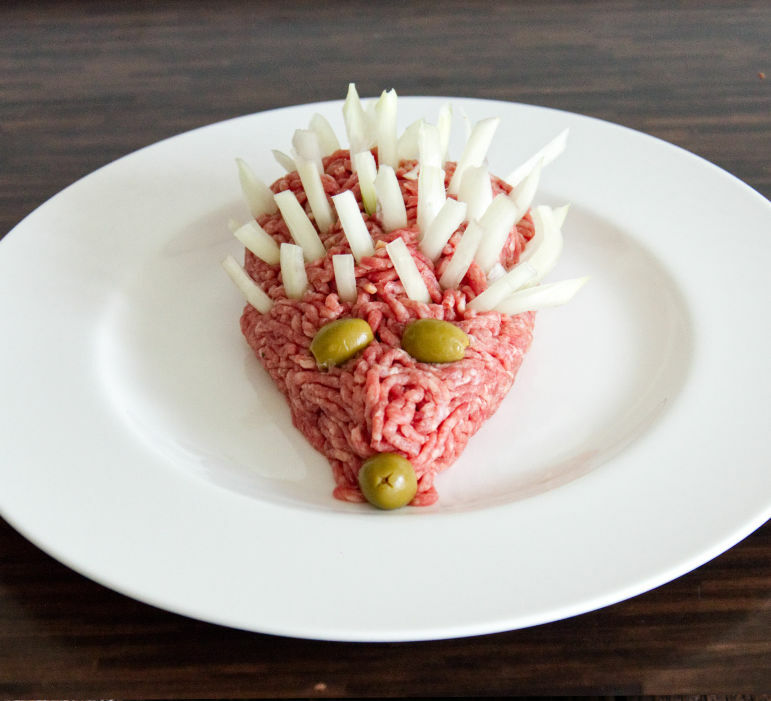 In Northern Germany, this dish is usually served with jacket potatoes and green beans. In Rhineland, it’s served with pan-fried potatoes or rye bread. The next very weird German mixture is Toast Hawaii, and this is a slice of toasted bread served with a slice of ham, slice of cheese, slice of pineapple, cranberries, or can be cherry on the top. I have seen this snack on some restaurants’ menus, and obviously at the German parties. The snack was invented by Clemens Willmenrod, who was the first German television cook. Muckefuck looks like coffee, it’s prepared almost in the same way like a coffee, but it’s not a coffee. 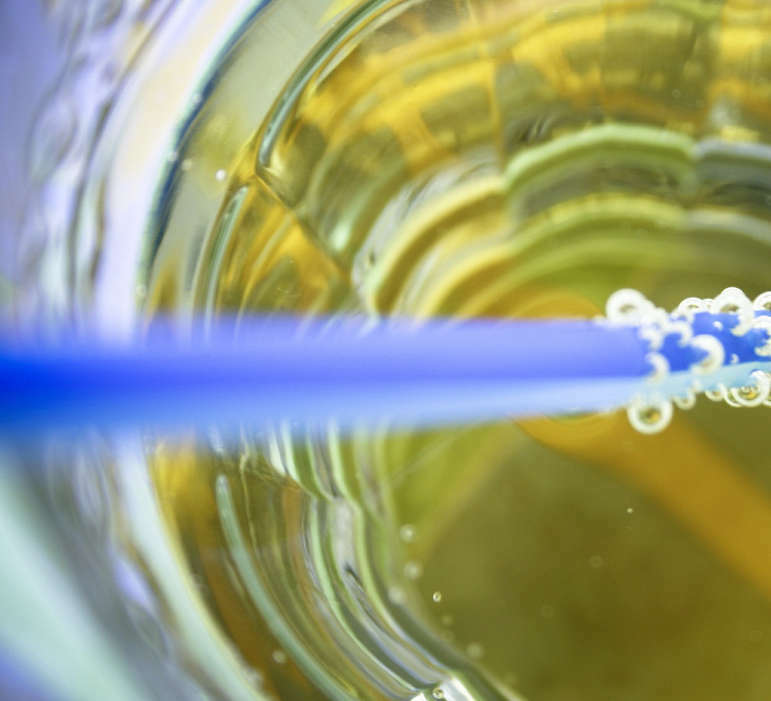 It is a drink not only well known in Germany but also in central and western Europe. The drink tends to imitate the coffee and it doesn’t have caffeine. And we are talking here about the beverage made out of roasted grains. If you want to try it, you should definitely have a look for Nestle Caro in the German supermarket. I have never seen it in the restaurant, though. The next thing on my list is actually Kreppel, which is a German doughnut. 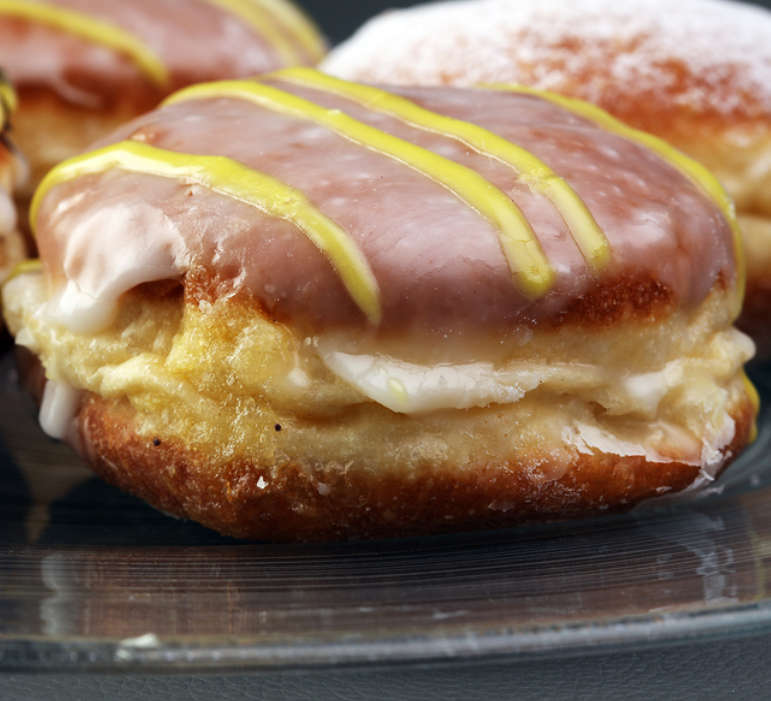 At a particular time of the year in particular parts of Germany, doughnuts are also filled with mustard. If you want to know more about this, please go ahead and watch my video about German doughnuts on the carnival time or the blog post with the same title. 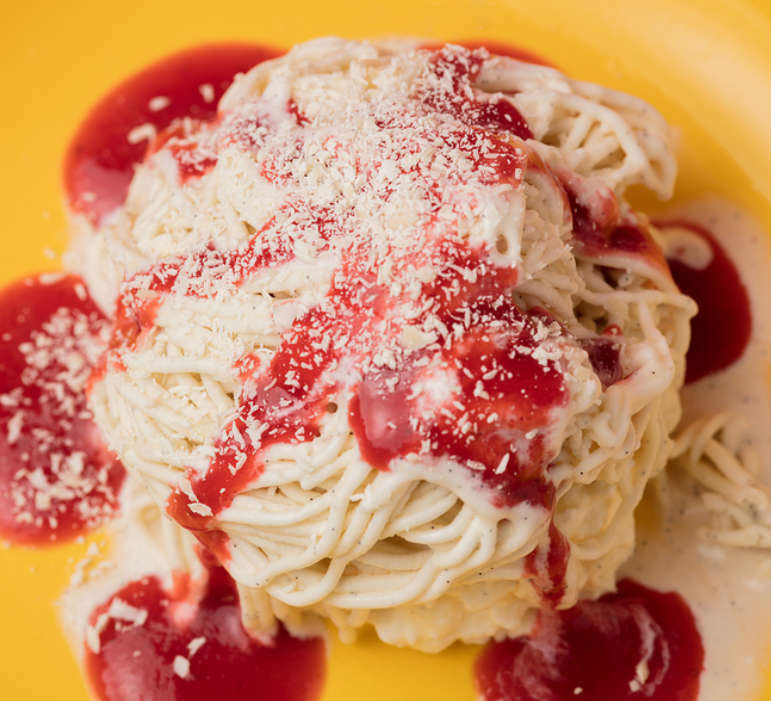 And finally, the weirdest dessert that you can find in Germany is Spaghetti Eis. The dish is made from vanilla ice, strawberry sauce, coconut flakes, or vanilla chocolate flakes on the top. The vanilla ice imitates spaghetti. The strawberry sauce imitates ragu. And the flakes imitate the Parmesan cheese. The dish was invested in Mannheim by Dario Fontanella, and at the beginning, it did actually make children cry, because they really wanted to get an ice cream in the ice cream shop. Unfortunately, there is also one thing I would like to mention, but I haven’t found any picture on the internet, so I cannot really show you. And this is mite cheese. Mite cheese is a cheese that is produced by using mites. To see it, you can put it in Google, and for the eating part, you’re going to have to go to Saxony-Anhalt. Please watch also our video!